That screen shot probably needs no explanation. But to be honest, I’ve lived a big chunk of my life experiencing sleep deprivation, probably due to my training as a doctor back during my residency training days. On average, I sleep 3-4 hours a day, but I can sometimes knock out 30 minutes while sitting on a chair during the day. It’s an odd phenomenon to the point that my colleagues have found some amusement in taking random pictures of me in all sorts of bizarre sleeping “configurations”. 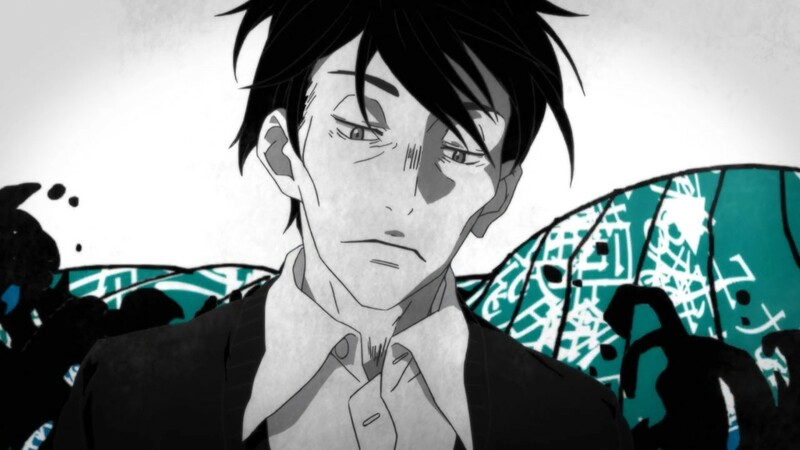 So seeing a sleep-deprived Shimada is pretty much the story of my life, at the moment. But yeah, I’m so glad there’s always Animu to help me unwind. There are only so many times that Anime as actually lulled me to sleep — and thankfully, none of the titles this season save for a few are capable of doing that. So how were things this week in Side A? Well, I’ll be honest and say that this wasn’t the best of weeks. Things were, how should I put it… noisy? Yeah, noisy works. So enough talk and let’s RUN ‘EM DOWN! A part of me appreciates the visual inventiveness of Akiyuki Shinbo, and his ability to expound on the evocative nature of the narrative in a way that is both unique and impactful. And yet another part of me wishes he could tone down his own personality quirks that seem to seep into the production. We see this in the first few segments of this week’s episode, which features a noisy — almost messy — squabble between Harunobu and that guy sporting a Union Jack sweater (can’t remember his name). The comedy is unnecessarily loud and doesn’t really add up to any characterization that I’m not already aware of. If anything, it works as a contrast to introduce Rei’s quirky engagement with Shougi, in that he seems more or less like a player that “feels” things. And this is quite interesting, because Rei has always been a character that has come across as highly logical. But perhaps this sort of visual representation — a loud, overly expressive Harunobu — contrasted to the rather taciturn, poorly-expressed Rei highlights just that: Rei’s inability to express himself. It’s funny that Rei has always been highly critical of himself, and yet much of his potential is wasted on his inability to focus on the strengths that actually mean a lot in the long run. And these strengths may very well be the qualities that allow him to play a good game of Shougi — specifically his inquisitiveness into the nature of people, as he has been doing so throughout the entirety of the show. Again, I go back again and again to the fact that Rei tends to beat himself up too much when the tools towards his own self-enlightenment are, really, all at his disposal. But moving on, the realization of his own lack of expressiveness is made known in a visually stunning segment, which related Shimada’s own self-expressiveness like that of a torrent. This isn’t meant to antagonize Rei in any way; rather, to make him realize his own lack of expressiveness — or at least a fear of expressing himself in a way that makes him feel pretentious. And as I think of this, the show does it again and segues into an endearing dialogue between Rei and his homeroom teacher, where the latter pretty much says everything that I have been wanting to say to Rei ever since — that he has to stop beating himself up and realize that it’s okay to be humble, but at the same time you have to be proud of everything you’ve been able to achieve, no matter how minuscule it might appear. So that was a nice little conclusion on that end, but then the show moves on to raise the issue of Rei and Kyouko’s relationship, as hinted by Akari’s own worries. It’s an interesting “cliff-hanger” that balances out the otherwise loud first segment. But overall, I’d say this was a nice mix of things this week with a satisfying conclusion. Man, we’re only a few episodes off till this show wraps things up, and already I’m starting to feel a bit more excited. To be honest, I was a little unsatisfied with the reveal in this week’s episode of Shôwa Genroku Rakugo Shinjû. Or perhaps the more accurate description would be that I’m starting to sober down a bit now that this sequel arc is starting to fall into place. The way the show relived the previous scenes of the last season from the perspective of Yotarô watching an old film reel was an interesting touch to something that might be otherwise perceived as a recap, but what kinda rubbed off weirdly for me was how Matsuda retells a markedly different story behind the events that lead to the deaths of Sukeroku and Miyokichi, which in my opinion felt quite inelegant in execution. Now I honestly don’t think what I just said was a spoiler (it was hinted throughout the show, and it’s even in the title), but I’ll save you guys the trouble and just say that I found it a very odd redirection that sorta made the show’s dramatic execution lose its magic effect on me. At the very least, the last scene with Yotarô and Konatsu was endearing, and was pretty much a very Yotarô thing to do. Yotariô has always been a sorta emotionally-driven character, and his run-in with his former mob boss makes it clear that he is somewhat verbally challenged outside of the arena of performing. 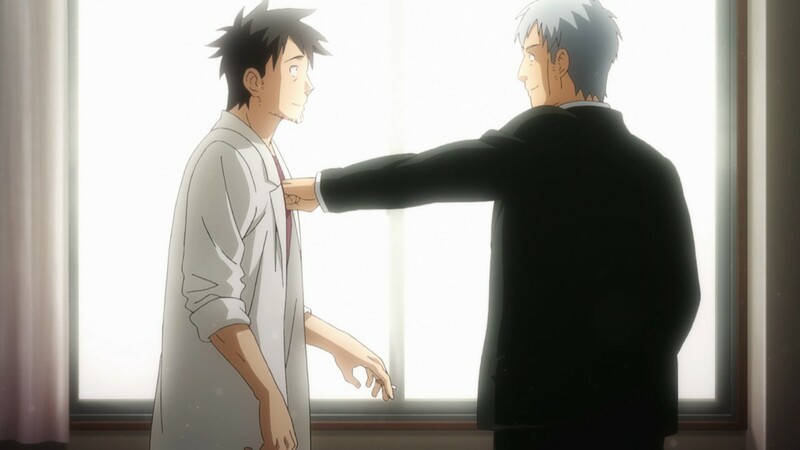 But that doesn’t stop him from wanting to express himself and show care for the people that he cares about, making him resort to simply embracing Konatsu whilst crying his eyes out. It’s a simple gesture that really brings home the character of Yotarô, and makes for an endearing image of what these two have been able to accomplish together. 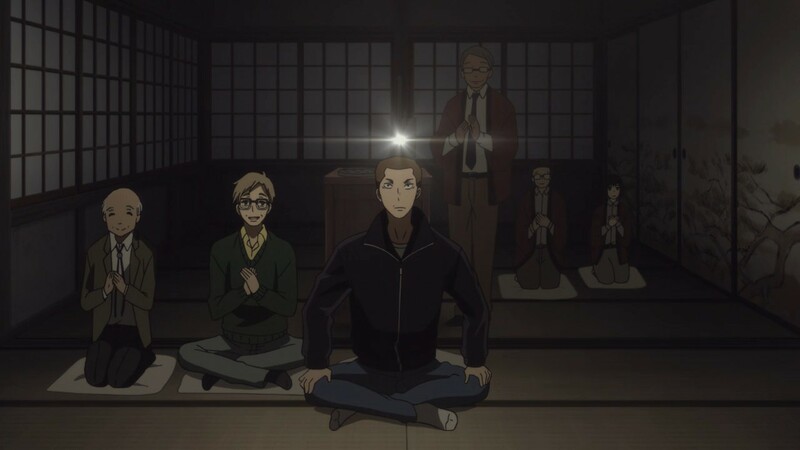 So despite my misgivings on the direction of the plot of this story, I’m still thoroughly impressed at how Shôwa Genroku Rakugo Shinjû has maintained its characters in a fully-actualized light. I really appreciate how the story is starting to gain some momentum with the return of focus towards Alisha and the current political turmoil in Ladylake. It’s also great that the show reintroduced its “evil mastermind” character, which was something I was alluding to in my previous post in how much of the story seems to have derailed from the overarching drama surrounding their Kingdom. But for some odd reason, I kept getting distracted by some minor details… details, in particular, involving clothing. For example, I couldn’t help but wonder why Maltran was still in her regular clothes despite being put in prison and then… hanged on a cross (if you consider that even being “hanged” to begin with). 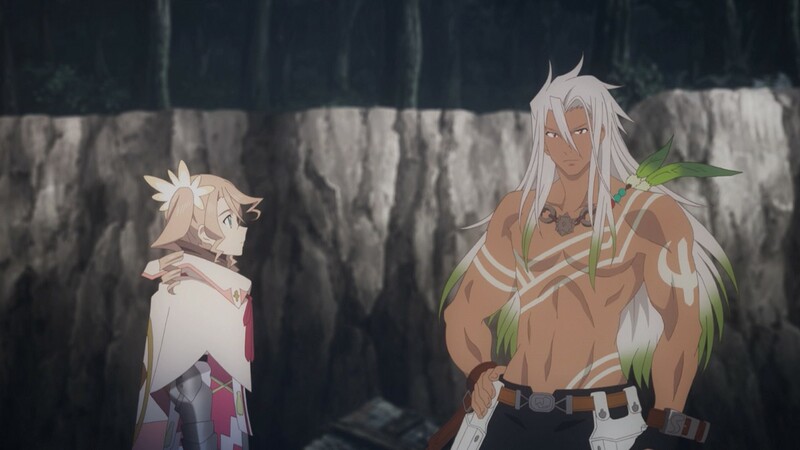 And then there’s Zaveid and his peculiar fashion sensibilities — which was amusingly brought up in the next episode premier segment. Looks like Alisha and I are on the same wavelength. Putting that aside, however, and the show is starting to feel like it’s coming full circle. But in retrospect, it feels like the whole journey to Rolance and Rose’s joining Sorey was a very long-winded prospect that could have been trimmed down a bit. There are just so many variables at play in this world that it’s hard to put things into perspective — like this whole thing about malevolence and dragons and tornadoes and fox-faced taunting stalkers and that scantily-clad witch character in the first episode. It’s come to the point that I feel like any reveal will leave me confused since I can’t draw the immediate connection to what the show is expecting me to draw. So yeah, this has been a pretty messy ride up to this point, but I won’t deny the fact that things are starting to get exciting. But action CAN be enjoyed for action’s sake — whether or not you feel satisfied in the end is the question. I’m starting to get a bit weary of this show. So yeah, they introduced two new characters, but one of them, Kurtz, is just so utterly useless. And not only that, his characterization is literally all over the place, ranging from meek and helpless, to creepy and socially awkward, to overly passionate and upright. In the end, he literally did nothing useful in this episode other than create noisy segments of painfully bad comedy. In fact, the “noise” of the first half of this show was so bad, I was left confused as to what the point of all of the jokes were. Technically none of them had to be there — it almost felt as if the storyboard writer was forced to throw in jokes in order to drag along the story, which for this segment only conveyed a very small bit of information regarding Ugaki and the presence of a larger oversight body that monitors Demis. In fact, the bigger weight of the episode occurred in the second half, where we had a legitimately engaging conversation between Tetsuo and Ugaki. Heck, even Ugaki’s description of Sakie’s unfortunate predicament as a succubus was endearing, and helped in drawing out Ugaki as a good mirror character to Tetsuo who is genuinely concerned for the welfare of Demi’s. But in Ugaki’s case, at least, he has a stronger attachment to Sakie that seems less romantic than it is more parental. The discrepancy between this second segment almost makes me feel like it was written by an entirely different person — and it’s this show’s inconsistency that frustrates me to no end! I genuinely think the premise of this show is good, but its haphazard execution and generally inconsistent tone makes for a very frustrating experience. So yeah, this was a pretty “noisy” week, but at the very least it helped to diffuse the tension I’ve been having all week long. I’m still itching to write my review on A Silent Voice, but yeah… I’m not gonna jinx the situation, so I’ll leave it at that. So until next time, ciao!